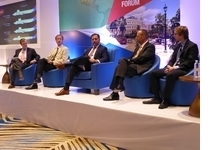 Registration is open for the ISTAT Latin America Forum. Join colleagues from around the globe on 9-10 November in Panama City, Panama to discuss the future of the Latin American aviation market and how airlines have modified their business plans during these challenging times. Register by 19 September to receive the early bird discount of up to $590 off conference registration. Attendees can also register for the optional golf outing and reserve rooms at a discounted rate at the Hilton Panama. Guests must book their rooms by 18 October in order to receive the discounted rate. ISTAT Europe is quickly approaching, and the ISTAT Europe mobile app and mobile-friendly site are the best ways to keep up-to-date with event activities. Use the app to contact other delegates (via messaging, and also to set up in-person meetings), view sponsor and exhibitor details, browse the event schedule and more. Event delegates can access information at www.istat.org/mobileapp. The ISTAT Appraiser Program is pleased to invite you to the ISTAT Appraiser 101 session on Sunday, 25 September from 13:30 - 15:00 at ISTAT Europe. This complimentary session is crafted for those who have an interest in becoming certified ISTAT appraisers and will feature an inside look into the ISTAT Appraiser Program, aircraft appraisal fundamentals and steps to becoming an appraiser. To attend, contact Ben Barclay at bbarclay@istat.org. 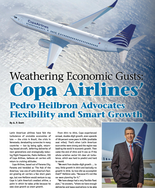 Latin American airlines have felt the turbulence of unstable economies as of late — the crisis in Brazil, the crisis in Venezuela, devaluating currencies in many countries — but by being agile, returning leased aircraft, deferring deliveries of next generations and strategically reducing flight frequencies, Pedro Heilbron, CEO of Cope Airlines, believes air carriers will return to cruising altitudes. Advertising space is now available in the winter issue of Jetrader magazine. Beyond our normal distribution to all ISTAT members in both print and interactive digital editions, this issue will have significant bonus distribution at the ISTAT Holiday Receptions in Miami and New York this September. For year-round access to ISTAT members, please reference the advertising opportunities available through ISTAT and Jetrader by clicking here, or by contacting: Erik Henson, Jetrader media director at +1 352-333-3443 or ehenson@jetrader.org. We are now accepting article submissions for the winter 2016 issue. If you are interested in sharing your expertise and contributing to the content of Jetrader, please contact ISTAT at istat@istat.org. CNN Joe Sutter, who led the engineering team that developed the world's original jumbo jet in the 1960s, died Tuesday, 30 August, at the age of 95, Boeing said. In a tribute, Boeing Commercial Airplanes CEO Ray Conner called Sutter "one of the giants of aerospace." Investor's Business Daily Boeing sees demand for new commercial planes in China reaching over $1 trillion in the next 20 years, making it the first trillion-dollar market in Boeing's forecasts. On 13 September, the aviation giant said in its annual China Current Market Outlook that it expects commercial airplane demand in China to hit 6,810 new planes over the next two decades, up 7.6 percent from its prior outlook. The planes are valued at $1.025 trillion. Reuters The European Union wants its own measures to reduce airline pollution from 2018 to 2020 ahead of when a proposed global deal is due to come into force and may extend its own system if it sees fit, European officials said on 12 September.